Huan Wu interviewed Chitra Ramanathan for UIAAAN in late summer 2016. UIAAAN: When did you begin to want to be an artist or plan to have a career related to arts? When you had this idea in mind, what did you do to realize it? Chitra: When I was four years old, that is, during my preschool years, my parents enrolled me in an art school for children in Kolkata (formerly Calcutta), India, where I grew up. I was told that a variety of art forms were taught there. I recollect drawing and painting ever since I can remember. My mother made sure I entered every art competition that came to her attention in the media! When I was ten years old, I won a top prize in a nationally publicized art contest with a panel of famous jury members judging the show which brought national recognition to the winners. This childhood experience, followed by a solo exhibition of my paintings featured at the Birla Academy of Fine Arts, along with a silver trophy presented to me by an eminent sculptor who was then head of the Government Arts College in Kolkata, were among milestones that shaped my later years. They led to my choosing Fine Arts for my Bachelor’s Degree at Stella Maris College, Chennai, India. When I moved to the United States, I pursued my art and earned a second Bachelor of Fine Arts degree in Painting with honors from the University of Illinois in 1993, followed by the Illinois M.B.A in 1997. UIAAAN: What was your Illinois experience when you were on campus? What or who were the most memorable people, faculty, classes or places for you? Chitra: I thoroughly enjoyed my undergraduate years, changing course from creating landscapes and portraits to develop a large collection of abstract paintings, many of which, to my surprise, sold shortly thereafter! The Chicago Art Institute was my favorite place to visit, and I spent time there as often as I could. Therefore, it was an honor when the ARC Gallery/Educational Foundation in Chicago featured a large collection of my student work in month-long solo exhibition during the summer of 1994. In the following years, from 1995 to 1999, five different galleries in SoHo’s Broadway in New York invited me to exhibit at their venues. 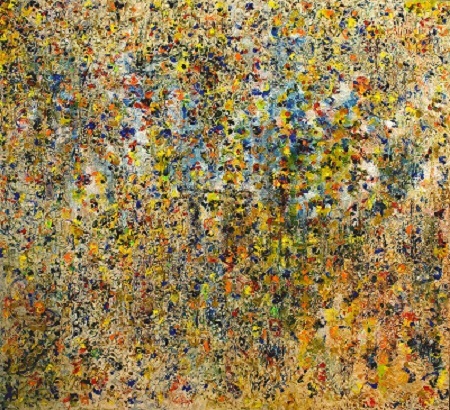 Some of the exhibitions attracted favorable reviews by art critics, including the Manhattan Arts International Magazine. Through my M.B.A years, I managed to continue exhibiting my work in New York, with appreciation from some of my professors, including Charles Kahn, with whom I had the pleasure of exchanging email recently, and who remembers my art, and Dean Paul Magelli and others who came across invitations from the galleries showing my work. UIAAAN: What made you decide to study Human Resources in graduate school, besides Art Museum Administration? How has the experience benefited your career and/or your personal development? Chitra: As an artist being selected to the M.B.A. program, I found Human Resources to best suit my temperament and prior experiences. Art Museum Administration was not offered as a concentration, so I created the coursework for it with the approval of my advisors, taking classes via teleconference from Professor Sokol, Professor of Art History at the University of Illinois at Chicago. The experience, and the fact that I was able to devote time for my art while simultaneously working on my M.B.A. coursework, helped me to fully launch my art career immediately after graduation. During the process, I became comfortable articulating about my art, and I began gaining some ideas about business, related to working on contracts, especially with commercial art galleries, dealing with sales and commissions. As for personal development, I became interested in and excited about teaching art with my academic knowledge, and have been for the last twelve years. I have taught courses and workshops in the various painting mediums at the Indianapolis Art Center, and currently am Faculty of the Art School of the Vero Beach Museum of Art, in Vero Beach, Florida. UIAAAN: You began to have exhibitions quite early after you earned your bachelor’s degree: how have the exhibition experiences affected your career and you? Chitra: As you have observed, my art career pretty much began soon after I earned my undergraduate fine arts degree. Binney & Smith, makers of Liquitex paints and Crayola crayons, awarded me a Product Grant for two consecutive years in 1994 and 1995. This award was a huge encouragement for a student, as you can imagine! I received assorted art materials worth $500 during each of the two years, providing me with a lot of art materials and great incentive to move forward. I became interested in creating paintings in large dimensions, many often measuring well over 12 feet. Although I never imagined it, the scale of the works actually attracted several collectors, with my work acquired by numerous buyers/collectors within Champaign and around the U.S. and Europe as well, through a website that posted my bio and images. In 2004, MGM Resorts International/MGM Mirage contacted me with a request to enlarge a pair of my earlier originals that the organization had chanced to find on the internet. I agreed, and the paintings (each measuring four feet across and six feet high) have been permanently displayed inside the Bellagio Conservatory indoor botanical garden at the Bellagio Hotel in Las Vegas since 2004. As the paintings are signed, this site-specific public art installation has continued to gain me recognition over the years. As recently as last month (August 2016), the CEO of a restaurant chain in Bloomington, Illinois, contacted me after viewing my installation in the Bellagio and commissioned me to create a three-panelled (Triptych) painting which I completed in early August. UIAAAN: What did you learn from your travelling experience of artist invitations as well as Professional Art Residencies? Chitra: In 2005, the Keeper and Head of the Royal Academy of Arts in London invited me for an Artist Talk and visual presentation of my body of work, along with providing critiques for the students at the Royal Academy Schools. The Art Residency invitations to the Scuola Internazionale di Grafica in Venice, Italy (2012), and the Camac Centre D’Art at Marnay sur Seine, France (2010), helped me focus on my work for an extended period of time in their exclusive facilities. UIAAAN: Where do you usually get insights for your artwork? Chitra: My travels to Europe since 1992, many of which have been dedicated to my art, have been great learning experiences and inspirations for my ongoing next paintings. I spent extensive time in France, and later Italy and Britain. The work of Claude Monet (the impressionist) and visits to the Monet Garden in Giverny, France, have been a major influence in my work. I have developed a series of abstract paintings that convey the theme of happiness. To get my idea across, I use attributes that might encourage the viewers to feel happy including use of bright glowing colors and collages that allude to faintly recognizable forms, comparing happiness to ephemeral garden blooms and cyclical seasons. UIAAAN: What motivated you to volunteer at the College Art Association? What did you learn from your involvement? Chitra: I first became academically interested during my M.B.A while choosing to complete the required summer internships at the New Museum of Contemporary Art in New York City, as well as the Krannert Art Museum and the Krannert Center for Performing Arts in Champaign-Urbana. In 1996, I was chosen to create the t-shirt design for distribution to students of the Illinois M.B.A Class of 1997, related to the Summer Olympics held in Atlanta in 1996. My membership and involvement in the College Art Association helped me to further my academic interests best when I served three-year terms each in the organization’s Committee for Cultural Diversity and the Committee for Studio Health and Safety Issues (for Practicing Artists). Formal academic exchanges and co-chairing/speaking during some of the CAA’s conferences greatly helped with enhancing my teaching skills in particular. UIAAAN: What do you consider to be your greatest challenge so far, and have you been able to overcome it? Chitra: I am happy to say that my only challenge has been finding extra time to create more work. With many diverse commitments within and outside the art industry, it is truly a constant challenge! To overcome it, I spend long hours beyond normal work schedules to keep up with producing new work. Since 2014, I have also been a professional artist member of the Artists Guild Gallery in Vero Beach, Florida, where my work is shown along with my fellow artists every month.